An underwriting infrastructure where speed, risk and return are in balance is the groundwork for more consistency in underwriting profitability and growth. However, the potential challenges to specialty insurance market growth are more intricate and challenging. In order to drive underwriting profitability and growth, you can have a vivid glimpse of the recent trends and developments in specialty insurance markets for profitable growth through insurance underwring. Would you like to know about the growth potential of the specialty insurance market?Do you need assistance with significant insights for the underwriting in specialty insurance market? Move ahead and read the following whitepaper that will address all your questions, including these: How to improve insurance underwriting process and underwriting profit margin? How can isurance underwriting drive profitable growth in specialty insurance? What are the key success factors for specialty carriers? 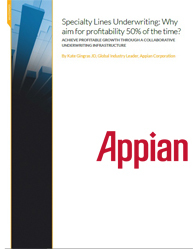 How to determine the underwriting expenses for underwriting profitability and growth? ''Big data analytics in insurance industry” has played an important role in managing their business processes. Today, carriers and intermediaries are engaged in improving data capture to help them to better manage their business, manage their risk and know their customers. As the business and regulatory drivers are pushing the industry to manage its data better, it’s become necessary for firms to adapt big data analytics in insurance industry. This whitepaper discusses the implications, characteristics, and benefits of the new data management era in Insurance, paying particular attention to specific use cases driving new technology trends. It will also explore the capabilities of both new and traditional data management technologies within this context. What big data can offer organizations in their businesses and how these new data management technologies interact with their existing database systems? 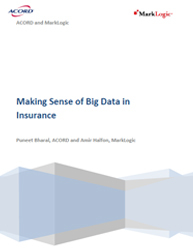 How you should look to benefit from new technologies associated with big data in your insurance industry? Where these new technologies associated with big data can provide value beyond the core transaction processing associated with policy administration and claims management? Which big data technologies are available there in market that can be used in the insurance industry? 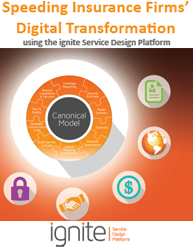 How the new technology is providing specific strategic benefits to insurance industry?